Home » Comics » New GWAR Comic to be Announced at New York Comic Con? Matt Miner will be at New York Comic-Con this week, from October the 4th to the 7th in Artist Alley table G-23, alongside his fellow Circle Pit Press creator Eric Palicki at our table. And they will have an NYCC exclusive, ashcan samplers of All We Ever Wanted: Stories Of A Better World limited to 50 hand-numbered copies. 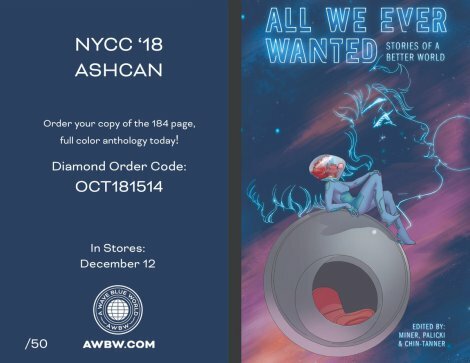 A black and white sampling of three stories with a colour cover by Ariela Kristantina with Michael Wiggam from the upcoming anthology for $5, with a sneak peek. Did you notice the GWAR mention? Matt Miner wrote the GWAR: Orgasmageddon comic book published by Dynamite based on the band. Could another be in the offing? And will NYCC be the place to announce it? Could be… why not pop to Artists Alley to ask them all about it?